Unfortunately, back pains, shoulder pains are symptoms of traumas and diseases of the musculoskeletal system, which accompany people of all age-related groups. However, the practice shows that the amount of similar diseases increases with age and efficiency of their treatment slowly, but stably diminishes. In such situations the most effective method of treatment is shock-wave therapy. Shock-wave therapy is one of the most effective methodologies of treatment of many diseases of the musculoskeletal system, backbone, joints, back pain, shoulder pain. When you were studying the detailed information about the shock-wave method on our web-site, you certainly marked for yourselves, that treatment of different diseases using the shock-waves is one of the most effective and progressive method. For this reason nowadays people of different layers of population use shock-wave therapy. Back pain, shoulder pain, pain in a heel is the symptoms, which are signals about the presence of violations in the area of muscular vehicle, backbone, joints. Effects of SWT at treatment of pain in a back, shoulder. I would particularly like to point out, that treatment of back pain and other ailments of traumatology improvement area observed after the first treatment, the effect is increased and pain gradually disappears. Specialists who work in Medical Center Awatage practice an individual approach to each patient and try to maximize the level of the procedures effect. Complete or almost complete getting rid of disease is achieved in just 3-6 sessions, each of which takes about 40 minutes (with the doctor`s advice). 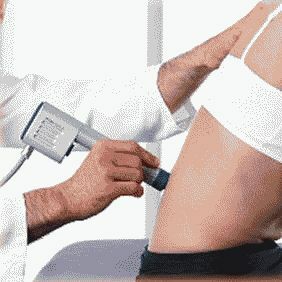 Shock-wave therapy is considered to be the most effective method of treatment of many diseases in the area of traumatology and orthopaedy (including pains in a back, shoulder, heel), in fact the mechanism of its affecting hearth of disease consists in that permeability of changing cellular membranes due to the influence of shock waves. Soft fabrics, which, as is generally known, consist of water, skip shock wave`s energy, which pass through the elastic membranes of cages and does not destroy them. Strained from an edema, the changed membranes of cages are included in resonance with a shock wave and as a result, they start to collapse. Thus, we can look after electoral influence of shock waves into a human organism: healthy cages remain untouched, patients (inflamed) start to collapse. A patient has to know that in the first sessions of shock-wave therapy unstrong pains can appear, similar that frequently arise up, when we are having a massage. Worrying is not needed, in fact through a few sessions pain disappears at all. Shock-wave therapy uses a large demand exactly because it shows the perceptible efficiency in the earliest possible dates. It is separately needed to mark that a presence of metallic posts a patient does not have contra-indication or obstacle for realization of shock-wave therapy. Nowadays shock-wave therapy is the most effective method of arthrosiss treatment without application of medications, surgical interference and some side effects. One of the main advantages of SWT method in treatment of arthrosiss is that, when the acoustic wave gets to the problem zone, it provokes the height of new capillaries, where they are not present and it is one of main reasons of this disease. Feed for cartilaginous and bone fabrics is a result of the improvement of blood circulation. It is the method of arthrosiss treatment. Treatment of arthrosis is one of the leading directions in the area of neurology in a medical center «Awatage». We have a successful experience of getting rid of this problem on the first and second stages. Shock wave therapy in the area of neurology and arthritis treatment , contractures, back and lower back pains.